With an image that’s more K-pop than Daejanggeum, School Food is the trendy Korean chain in Hong Kong. As no reservations are taken, we queue for a bit before settling into a table. We are offered a token to turn on the funky jukebox, which blasts K-pop music for the venue's background. School Food’s menu is a modern take on Korean cuisine. You won’t find any barbecue, japchae or haemulpajeon. 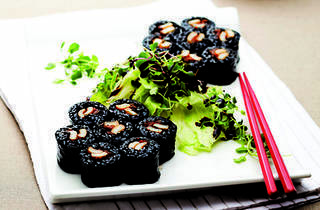 Instead, the headlining dish here is mari, or Korean-style sushi. We start with the signature Blooming Mari ($62), filled with marinated beef and pickles, and wrapped with a soft seaweed and a thin egg batter. Served warm, it’s the ultimate comfort food. 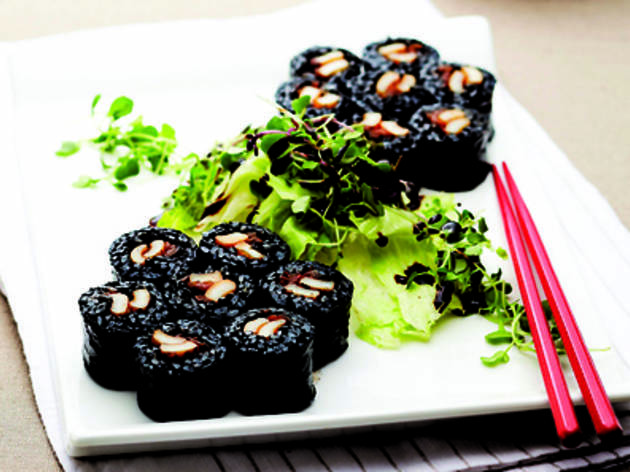 Another popular recommendation is the Squid Ink Mari ($68), which contains broiled, chopped-up squid wrapped with rice that’s been dyed with black ink. Although unappetising in looks, it actually tastes similar to a chewy Japanese tako roll. We continue with a fusion dish – Carbonara Topokki ($62), which is a Korean rice cake cooked with carbonara sauce. Though an interesting combo, it’s not a mark up from the original ddeokbokki. The noodles fare much better. The School Naengymyeon ($70) is a delicious cold thin buckwheat noodle dish with pickles and a boiled egg. Slightly spicy, the icy broth brings out the tanginess of the Korean chilli. On the other hand, the Deep Fried Vegetable Udon ($65) is pure warmth, with a rich bonito broth, thick udon and lightly battered vegetables. It’s best to come here with a few friends, and mocktails like the Strawberry Do Do (strawberry, Yakult and milk, $55) and Pineapple Althie with fruits and soda water ($88) flesh out the rest of the fun.